If I had wanted four plus additional years of pointless war I could have voted for the John McCain/Sarah Palin traveling circus in 2008. Instead, I voted for Obama in the desperate hope (there is that word again!) that he might actually do what he claimed and get us out of Iraq and Afghanistan. So much for that idea. 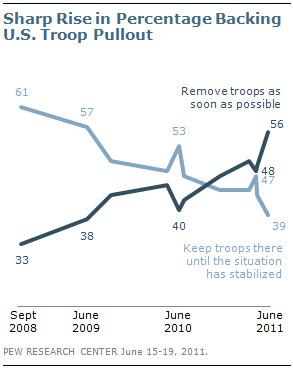 Now, even when a majority of respondents in polls say we should get the heck out, Obama is waffling and prevaricating. For crying out loud Barack, nearly half of all Republicans think we should get out! To say that the President's announcement the other evening is a disappointment is a gross understatement. The folks over at The Nation get it pretty much right - Obama is not even making political hay out of the situation. Fortunately, I have been teaching each day and so managed to avoid posting on this political charade earlier in the week. That said, I won't make the same mistake in 2012. P.S. : Having managed to execute Bin Laden after a decade, I am still not sure what further "success" anyone thinks we might have in Afghanistan - at least what "success" we might have in military terms.